Unexpected Gifts is the subject of the special Valentine edition of Dorothy Wilhelm’s internet radio show, “Swimming Upstream,” playing at this very moment at www.itsnevertoolate.com. The idea of the show is that love – like valentines – can come at unexpected times and in unexpected packages. Sam Longoria’s bio says he was born in a volcanic crater on Mars. This may not be completely accurate. The first “gift package” is a reading by Sam Longoria, of “The Gift of the Magi” which is often told as a Christmas story, but is really a tale of unconditional love. Sam Longoria is a well known Producer-Director of independent films. He’s perhaps best known for his work on the original Ghostbusters movie, but if you go to his bio SamLongoria.com you’ll find that he’s shot movies in every format. Of course, his biography also says, “Sam was born in the crater of a live volcano, on the planet Mars.” Sam has provided the introduction to Swimming Upstream since the show began. For today’s show, he offers his own interpretation of O. Henry’s Gift of the Magi, which he recorded during the recent earthquake in Alaska. That slowed him down, but didn’t stop him. Typical. 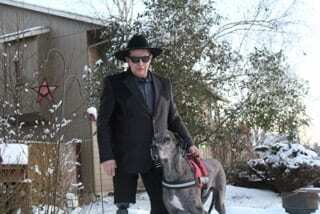 The second story of true love on the Valentine show, is the story of Bud Rigoulot, and his new love, his Great Dane Service Dog, Wrigley. Bud was a standup comic, but a brush with death in the form of a surgical infection cost him a leg. Bud Rigoulot often speaks at schools. Now he is an inspirational speaker, sharing with audiences the story of his Journey. Bud added this note during the recent snow storm. “Wrigley is out with us braving the weather helping homeless families and helping the Shelters with food and clothing, we have had people donating so much during this storm and we are going around picking it up and giving to others, we made 200 sandwichs, for the kids and their families in need.” For this show, Bud shares what it’s been like to get acquainted with his really, really new – really, really big friend.